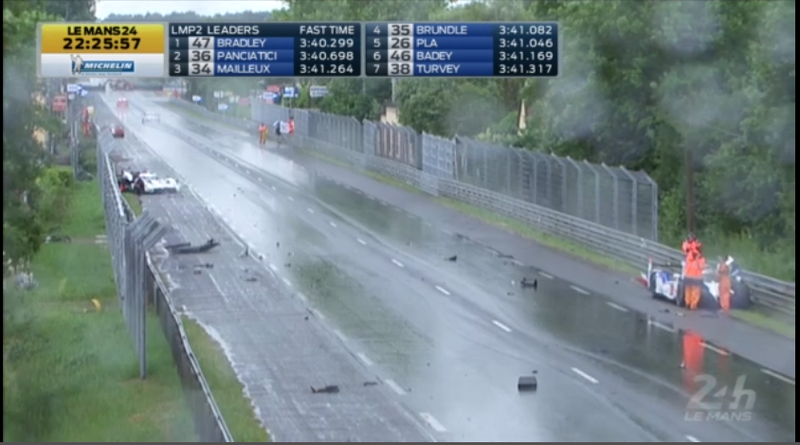 Just as the rain began at the 24 Hours Of Le Mans, the #8 Toyota driven by Nicolas Lapierre caused a massive accident involving the #3 Audi driven by Marco Bonanomi and the #81 Ferrari driven by Sam Bird. It looks like it's race over for these drivers today. It was tough to see what happened on the cameras, but it sounds like the #8 Toyota lost control and then later, perhaps as they were slowing down, the #3 Audi was reportedly struck by the Ferrari. The race has been under Safety Car since. UPDATE (11:30 AM): According to the TV commentators, it seems as though the Toyota spun out, and the Ferrari hit the Audi in a separate incident, though it remains unclear. The Audi and Ferrari are out of the race, though the Toyota may be able to rejoin the race.